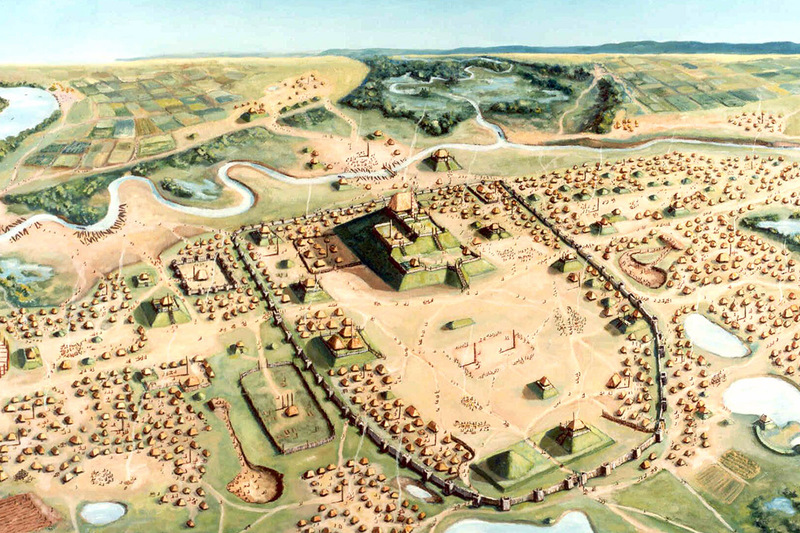 CHAMPAIGN, Ill. — Two University of Illinois anthropologists talk about their work at the ancient city of Cahokia in a new, four-part documentary about the cities built by Native Americans prior to European colonization and their sophisticated cultures. “Native America” will premiere on PBS beginning Oct. 23. The episode featuring U. of I. researchers, “Native America: Cities of the Sky,” will be screened at 7 p.m. Oct. 10 at Spurlock Museum, 600 S. Gregory St., Urbana. A panel discussion will follow. The Illinois Prairie Research Institute, WILL Radio TV Online and Spurlock Museum are co-hosting the event, which is free and open to the public. The episode features Timothy Pauketat, a professor of anthropology and of medieval studies and a visiting research scientist at the Illinois State Archaeological Survey, and Kristin Hedman, the assistant director of bio-archaeological research for the survey. Both study Cahokia and its people through evidence uncovered by excavations at the pre-Columbian city in Illinois, near present-day St. Louis. The documentary takes an alternative view of early urbanism in the Americas and considers how looking at history from different perspectives changes what scientists think they know about the civilizations that lived in early urban centers, Pauketat said. It looks at Cahokia and other early cities through both cutting-edge science and indigenous knowledge. It includes Native American tribal members who are descendants of the people who lived at Cahokia and who share stories of their culture passed down through oral storytelling traditions. Their stories complement archaeological evidence found at the Cahokia site, Pauketat said. Cahokia was built beginning around A.D. 1050, following a time when the social order in the region was more chaotic, he said. The city reached a population of about 20,000 by 1100, drawing people from outside the immediate area. Its population quickly declined after 1200 and the city was abandoned by the late 1300s, perhaps as a result of a megadrought. Archaeologists are increasingly interested in looking at how ancient people engaged with the landscape on which they lived, Pauketat said. During recent work at Cahokia’s East St. Louis precinct – which Pauketat believes to be the largest archaeological excavation in the Americas – ISAS scientists found that buildings in the city and surrounding shrines align with the position of the sun or moon at different times. This is consistent with urban complexes built in Mesoamerica, he said. “We’re realizing that the basis of urbanism is religious. Things were done in concert with the movement of the moon and stars and sun. By aligning themselves with celestial movements, (the people at Cahokia) were living an urban and a religious life simultaneously,” Pauketat said. In the episode, Hedman discusses evidence of human sacrifice that was part of the religious rituals at Cahokia and other early cities, including those in Mesoamerica. Archaeologists have uncovered thousands of buildings at the Cahokia site and its surrounding outliers. Animation and 3D computer modelling in the documentary help bring the cities to life. Pauketat hopes the documentary will help draw more attention to the site and help preserve it. “Most people in the U.S. and in Illinois and Missouri do not even know this place exists. As an archaeologist who works down there, I see it being destroyed. It’s going away,” mostly as a result of development, he said. Editor’s notes: More information about the documentary screening can be found online. To reach Timothy Pauketat, email pauketat@illinois.edu.